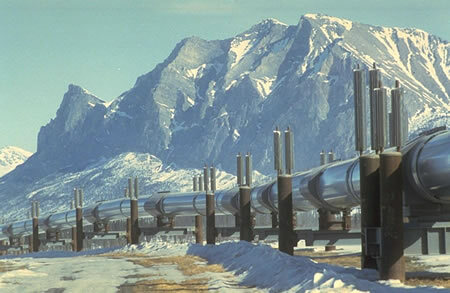 The 800-mile-long Trans Alaska Pipeline System (TAPS) is one of the largest pipeline systems in the world. It stretches from Prudhoe Bay on Alaska’s North Slope, through rugged and beautiful terrain, to Valdez, the northernmost ice-free port in North America. All of the oil is transported to refineries in the United States. The concept of transporting oil south from Alaska was discussed as early as the 1960s. 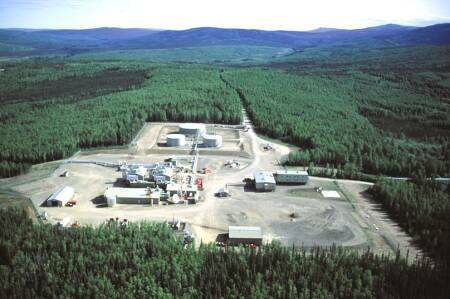 In 1968, large crude oil reserves were discovered at Prudhoe Bay by the Atlantic Richfield Company (ARCO). 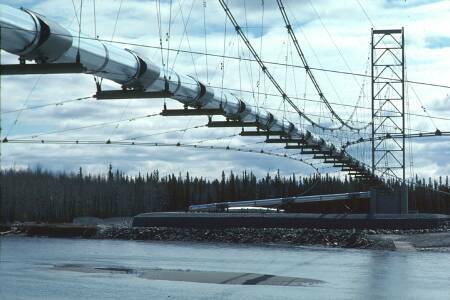 ARCO joined with BP Oil and Humble Oil to form the Trans-Alaska Pipeline Systems (TAPS). 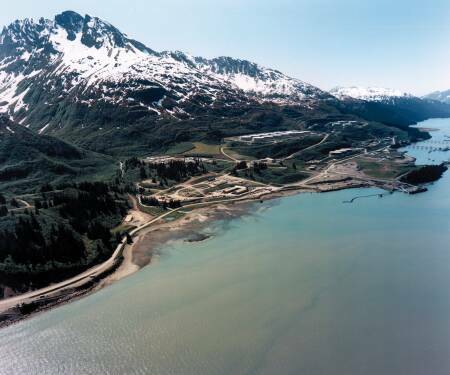 TAPS was proposed to ship crude oil to the southern Alaska seaport of Valdez (an ice-free port), from where it would be shipped to refineries by tanker. 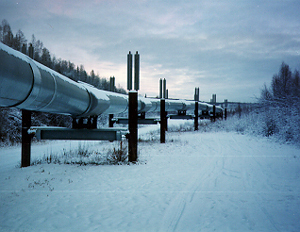 Pipeline construction from Prudhoe Bay required transiting a route where much of the right-of-way was on federal and state lands. Legislation (the Trans-Alaska Pipeline Authorization Act [P.L. 93-153]) was required to end what had become a stalemate over the route. This right-of-way legislation enabled the pipeline to be constructed. 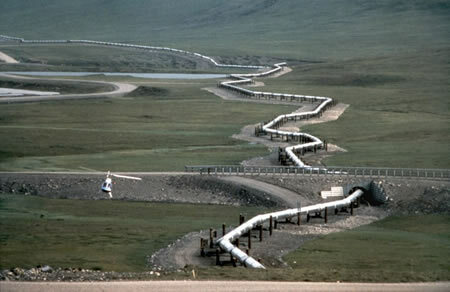 Environmental studies for the pipeline were started and applications for permits submitted in 1968. Suits were filed by environmental groups and others to block pipeline construction in 1970. Several Native villages filed a lawsuit claiming the pipeline would cross their land. The land ownership question was settled with Congressional passage of the Alaska Native Land Claims Settlement Act and its signature into law by President Richard Nixon in December 1971. 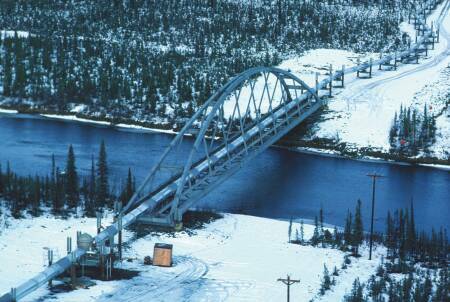 The 48-inch special cold-weather steel was ordered from Japan in April 1969. The building permit for the pipeline was issued in 1974. The pipeline route would cover 800 miles from Prudhoe Bay to the port of Valdez, the northernmost ice-free port in the United States. Actual construction began in April 1974 and was completed in June 1977 at a cost of approximately $8 billion. At the time, it was the largest privately funded construction project in history. Approximately 2,000 contractors and subcontractors, as well as approximately 70,000 workers, were employed to work on the project. 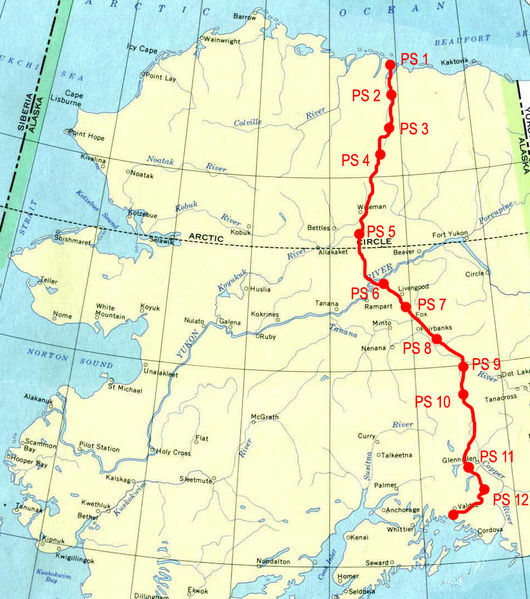 Paralleling the pipeline from Livengood to Deadhorse, the Dalton Highway (locally known as the Haul Road) was built as a supply route for use in construction, operation, and maintenance of the northern portion of TAPS and the oil fields on the North Slope. This road is now a State highway. 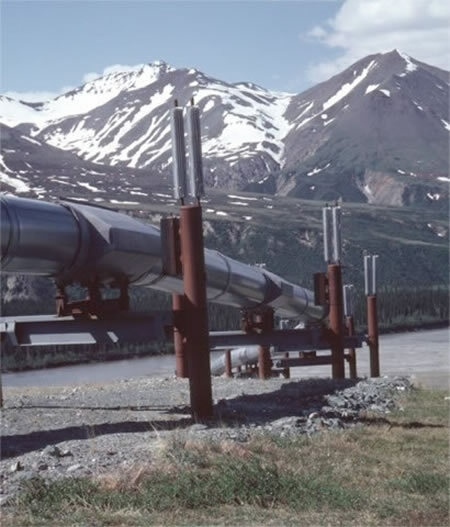 The Alyeska Pipeline Service Company, named after the Aleut word Alyeska meaning mainland, was established in 1970 and charged with designing, constructing, operating, and maintaining the Trans Alaska Pipeline System, commonly called TAPS. 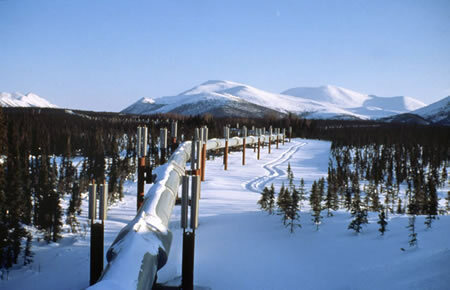 The Trans-Alaska Pipeline System was designed and constructed to move oil from the North Slope of Alaska to the northern most ice- free port- Valdez, Alaska. Crosses three mountain ranges and over 800 rivers and streams. Cost to build: $8 billion in 1977, largest privately funded construction project at that time. Construction began on March 27, 1975 and was completed on May 31, 1977. 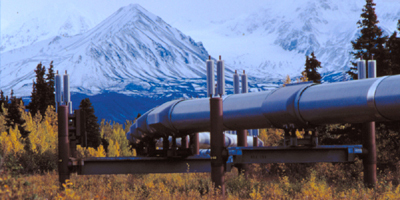 Over 14 billion barrels have moved through the Trans Alaska Pipeline System. 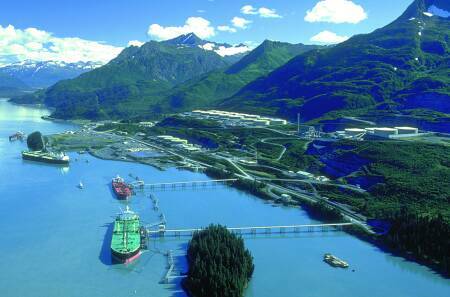 Tankers loaded at Valdez: 16,781 through March 2001. Storage tanks in Valdez- 18 with total storage capacity of 9.1 million barrels total. Maximum daily throughput — 2.136 million bbl., avg. (With 11 pump stations operating). Rates exceeding 1,440,000 bbl./day assume drag reduction agent (DRA) injection. Fuel required for all operations (fuel oil equivalent) — 210,000 gal/day (also see fuel requirements under Pump Stations, and Marine Terminal). Pump Station facilities in original design — 12 pump stations with 4 pumps each. 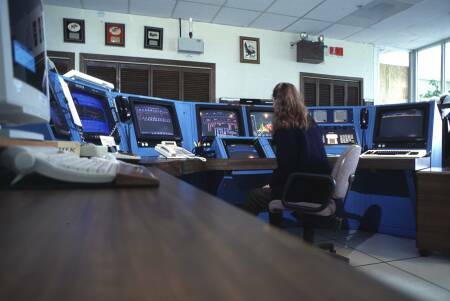 Pump Stations operating, Nov. 1, 1998 — 7: PS 1, 3, 4, 5, 7, 9, 12. PS 5 is a relief station only. PS 11 is a security site. PS 8 placed in standby June 30, 1996. PS 10 placed in standby July 1, 1996. PS 2 placed in standby July 1, 1997. PS 6 placed in standby August 8, 1997. Approximately $8 billion for construction of entire system, including Terminal and pump stations, at conclusion of initial construction period in 1977. Does not include interest on capital investment, or capital construction after 1977. Animal, elevated, minimum height — 10 ft. Selection — Soil sampling and other means were used to determine soil types along the route. Where thaw-stable soils were found, the pipeline was buried in the conventional manner. In areas of thaw-unstable soils, and where heat from the oil in the pipeline might cause thawing and consequent loss of soil foundation stability, the pipeline was insulated and elevated above ground by means of a unique support system. Conventional below-ground — 376 mi. Refrigerated below-ground — 4 mi. Above-ground — Specially designed vertical supports were placed in drilled holes or driven into the ground. In warm permafrost and other areas where heat might cause undesirable thawing, the supports contain two each, 2-inch pipes called "heat pipes," containing anhydrous ammonia, which vaporizes below ground, rises and condenses above-ground, removing ground heat whenever the ground temperature exceeds the temperature of the air. Heat is transferred through the walls of the heat pipes to aluminum radiators atop the pipes. Conventional below-ground — The pipe is underlain with a layer of fine bedding material and covered with prepared gravel padding and soil fill material, in a ditch from 8 ft. to 16 ft. deep in most locations, but up to 49 ft. deep at one location. Zinc ribbons, which serve as sacrificial anodes to inhibit corrosion of the pipe, are buried alongside the pipeline. The Atigun pipe replacement section, 8.5 miles in length, has four magnesium ribbon sacrificial anodes installed. Electrical currents in the earth's surface, called "telluric currents" and caused by the same phenomenon that generates the Northern Lights, can be picked up by the pipeline and zinc anodes. The zinc anodes act like grounding rods to safely return these currents back to the earth, reducing the risk of damage to the pipeline. Special burial, non-refrigerated — In areas of thaw-unstable soils calling for elevated pipeline construction, but where the pipeline had to be buried for highway, animal crossings, or avoidance of rockslides and avalanches, the line was insulated, to protect the permafrost from the heat of the pipeline, and buried. Special burial, refrigerated — In some areas the line was insulated and buried in a refrigerated ditch. Refrigeration plants at each of these points circulate chilled brine through loops of 6 inch diameter pipe to maintain the soil in a stable frozen condition. Pipeline buried in the standard method lies on a layer of bedding material (well drained sandy gravel without sharp rocks) covered with prepared gravel padding and soil fill material. Refrigerated below-ground pipeline, thickness-3.2 in. Used in Atigun Floodplain Pipe Replacement Project for scour protection of the new pipe because less cover on top of new pipe. Gabion mats, used 31,750 ft. Concrete mats, used 9,525 ft.
Federal government-6.27 sq. mi. approx. State government-7.79 sq. mi. approx. Federal government- 376 mi. approx. Pipeline in municipal jurisdiction, approx. Arctic North Slope Borough - 179.2 mi. Fairbanks North Star Borough - 89.1 mi. City of Delta Junction - 5.5 mi. City of Valdez - 20.8 mi. Definition - Amount of oil in pipeline from PS 1 to Marine terminal. The linefill is 9,059,057 bbl. Access roads, dimensions — 120 ft. to 7.5 mi. long; 28 ft. wide, minimum 3 ft. gravel base. Access roads, number — 225, linking state roads with pipeline, pump stations and airfields. Galbraith Lake — 5,200 ft.
Pressure Relief Station — 1 (PS 5, reinjects oil drained down for pressure relief, but does not have mainline pumps and does not boost total stream). Marine terminal — 1 (Valdez). Pig launching/receiving facilities — 3 (PS 1, 4, and Marine Terminal). Pipe shoes, number — 39,000 approx. Pump Station 7 is about 1.3 miles southeast of the Tatalina River in a wooded area. PS 7 is similar to PS 2 with two mainline pumps instead of three. Each 40 ft. length of pipe expands .031 inches with each 10° F rise in temperature and contracts the same distance with each 10°F drop in temperature. Longitudinal expansion of typical 720 ft. straight above-ground segment from min. tie-in temperature to maximum operating temperature - 9 inches. Tie-in to hot position - 8 ft.
Tie-in to cold position - 4 ft.
Above-ground sections of the pipeline are built in a zig zag configuration to allow for expansion or contraction of the pipe because of temperature changes. The design also allows for pipeline movement caused by an earthquake. Types — 16, to accommodate variety of soil and permafrost conditions. Depth at which embedded — 15 ft. to 70 ft.
Anchor supports — 800 ft. to 1,800 ft.
Standard supports — 60 ft. approx.